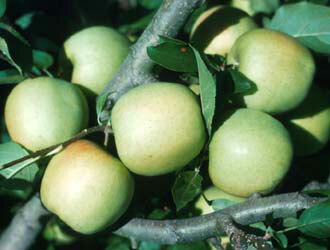 Susceptible to mildew, moderately resistant to scab and fireblight. Delicious, Granny Smith, Jonathan, Bonza, Gala. Golden when mature with slight blush sometimes; long stalk, bruises easily; can get russeted in cool conditions in spring. Creamy yellow flesh, excellent flavour, sweet and juicy. Mid March, similar to Delicious.